PocoLog for Palm - Available Now! PocoLog allows you to decide what you want to track! Create any number of activities... Running, Cycling, Swimming, Walking, Soccer, Hiking, Fishing... it's up to you. 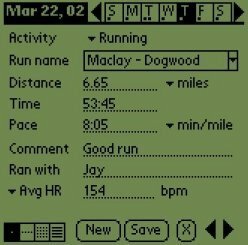 For each activity decide if you want it to keep track of courses, distance, time, pace, or speed. 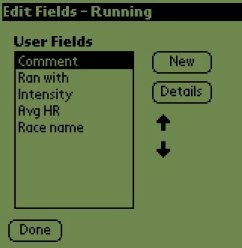 If you decide to track distance, time, pace/speed just enter any 2 values and PocoLog will calculate the third for you. Add any number of other fields that you want to track. You can use PocoLog to track anything. Daily, Weekly, Monthly, and List views to see your activities the way you want to see them. The weekly view lets you quickly view an entire week's worth of activity on one screen. 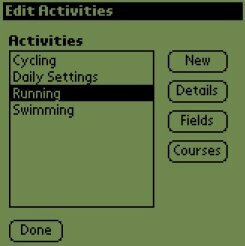 You can choose to show all your activities for the week (shown at left), or pick a single activity. 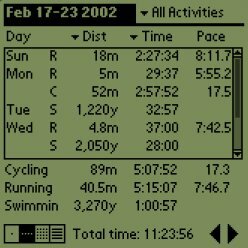 When you show all your activities, the totals for each activity and a total time of all activities is displayed at the bottom. 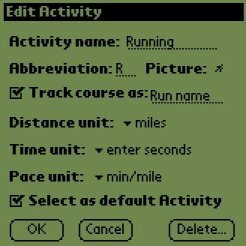 You can choose between showing Distance, Time, Pace, Course, or ANY of the other fields you have defined for each activity. Click Here to see more samples of things you can do with the weekly screen. The Monthly view lets you see an entire 6 weeks of activity. Use the built-in picture editor to create pictures or letters to represent the activities you do. 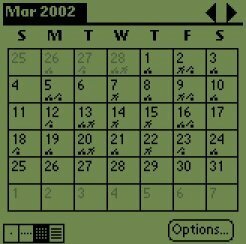 Just click on a day to go to the Daily entry for that day. You can configure an activity to track exactly the fields and units you want to track. Define any number of fields for each activity. Each field represents a particular item you want to track. 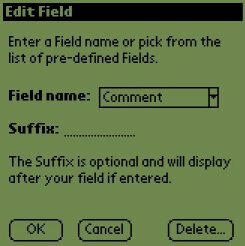 PocoLog gives you a list of pre-defined fields you can choose from, or you can make up one of your own. You can track ANYTHING you want to track. Built-in picture editor for creating the graphic you want to display on the Monthly view. 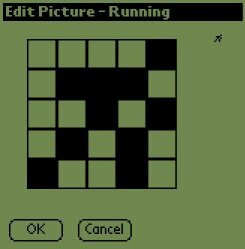 Use it to draw pictures or letters to represent your activity.